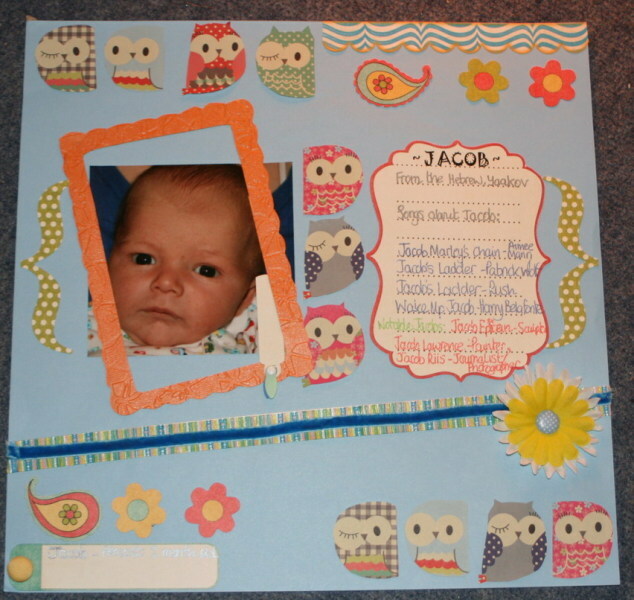 Not long after my grandson was born I bought 4”x6” photo album from Paperchase which cost £1.50 (approx $2.17). 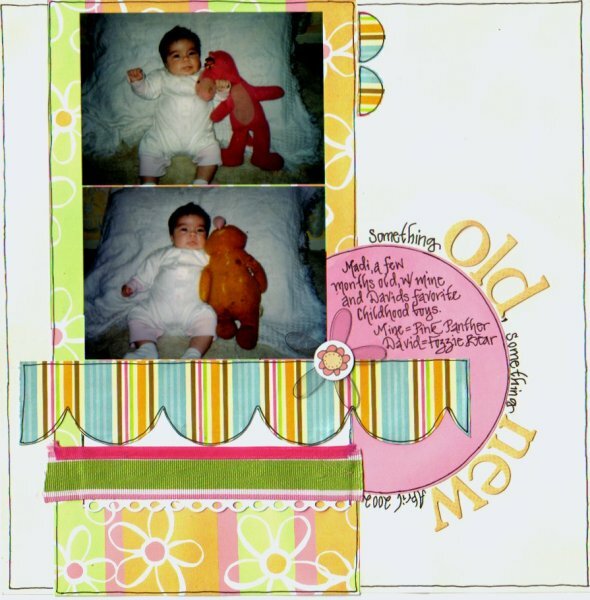 I just wanted something I could put a few photos in so I could show everyone what a gorgeous grandson I had – a ‘brag book’ I think the guys and gals over the pond call it. For the photo album cover I kept it simple by cutting two peices of felt and just hand stitched them with embroidery silk. I then used a Cuttlebug to cut some amimal, flower and butterfly shapes, which again were stitched on. 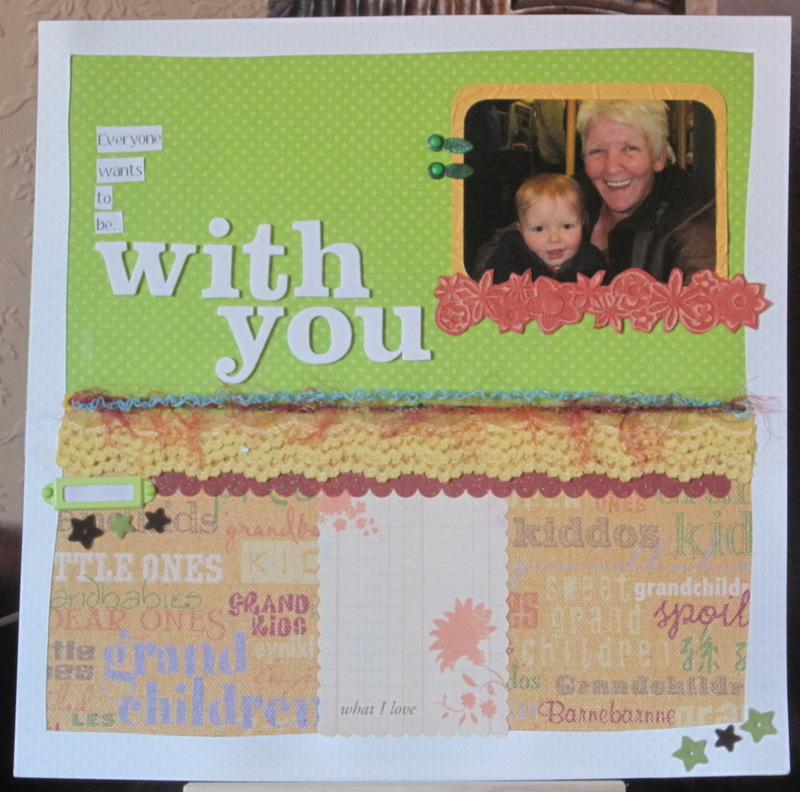 For the album covers front and back I added cardstock, fun stickers and peel offs as well as my grandson’s name. 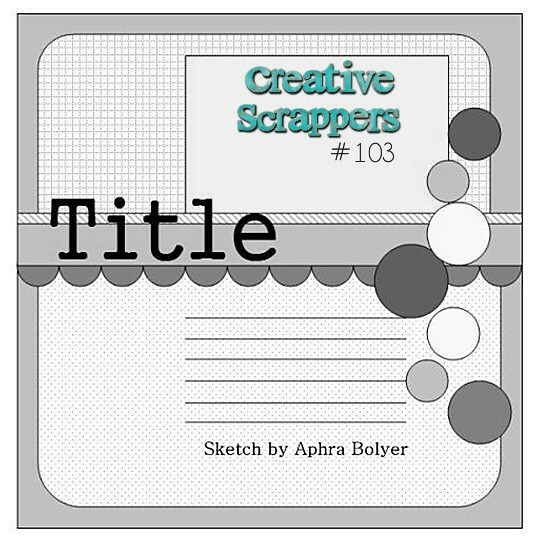 On the 10th May I posted a sketch from Creative Scrappers – #103. I said I would be putting a layout together from the sketch. Well here it is! I started with a 12×12 piece of green Core’dinations cardstock. I also used a yellow strip of core’dinations for across the centre of the layout. 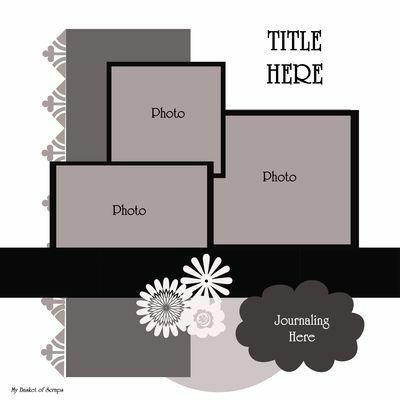 I am a big lover of Sassafras Lass papers and border and decided I wanted to use them for this layout. 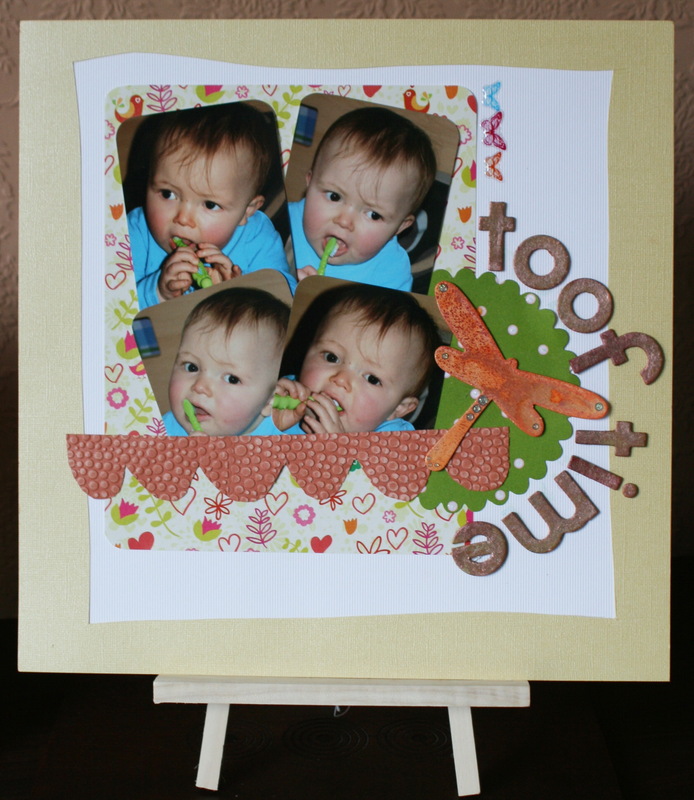 I have used papers from two different ranges & cut outs from another range. The layout is called Jacobiscotti as my grandson is called Jacob (as most of you probably already know) and he is eating a Heinz baby biscotti biscuit. This is my grandson Jacob. The picture was taken at hospital the day he was born. 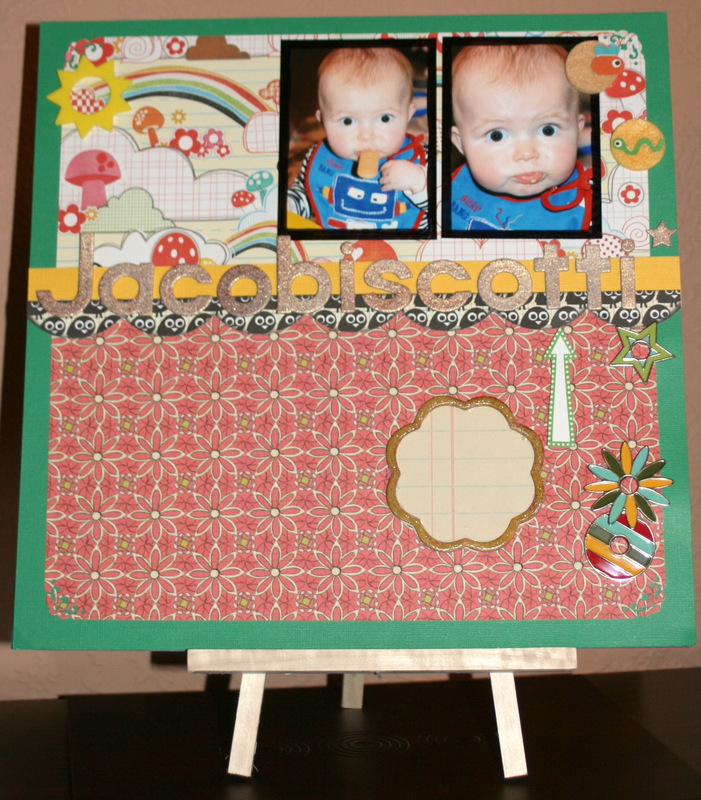 I wanted to do a layout about his birth which I think will be lovely for him to look at when he gets older. I am not sure who the base cardstock is by (but I can find out if anyone wants me to), I added a sheet of Papermania’s scalloped 8×8 textured cardstock. After shaping the photograph I layered it onto a piece of DCWV Nana’s Nursery cardstock. After that I added the alphas for the title and rubs for the birth details and finished off with some ribbon/button & chipboard/brad embellishments. Done! This is one of my earlier layouts, but I still really like this one. On the 28th April I posted a sketch from Scrap Tiffany and said I would show you my interpretation of it. Well…..here it is. I put the layout together using a kit I got QVC (yes, another one) which incidentally came in a lovley tin which can be reused, called Tuttie Fruitee. 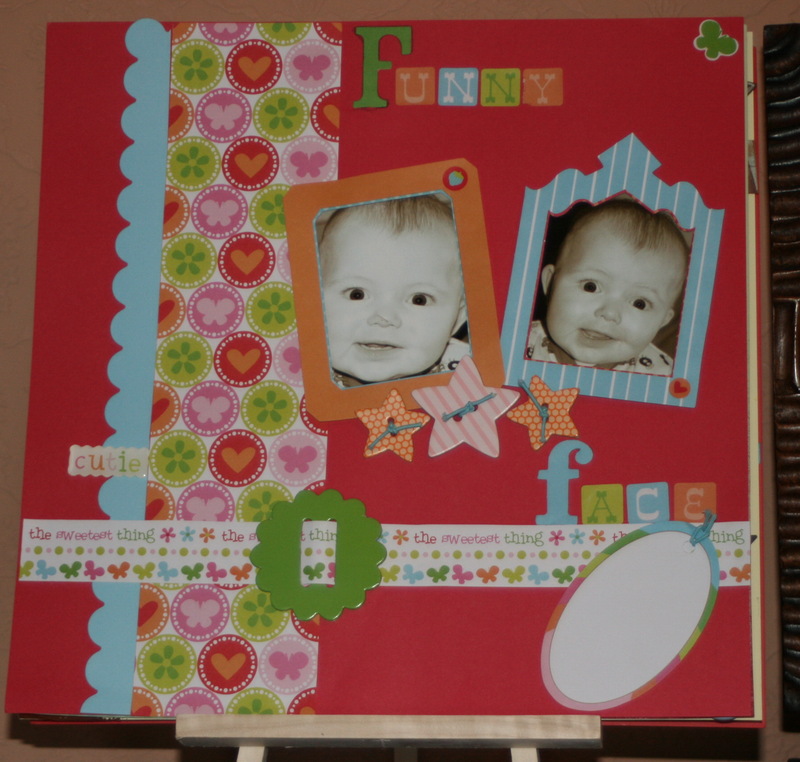 I wanted to use this kit as it is fun and bright and I think it fit really well with the two photographs. I printed the photographs in black and white so they would stand out against the colourful layout. I put this layout together to record information about my grandsons name. I used a piece of 12 x 12 blue paper as a base and Bazzill Bling which I die cut then embossed for the frame around his picture. Embellishments were by MME, I also used a base strip by Sassafrass Lass and the owls are from sheet of wrapping paper I bought at Paperchase. As you can see I also used ribbon and fabric flowers.